(4) Figures to the right indicate full marks. 1(a) A circle of 60mm diameter rolls on a straight line without slipping. Draw the locus of a point 'P' for complete revolution of the circle. The point 'P' is 38mm above the straight line and towards the right of vertical centre line of the circle. 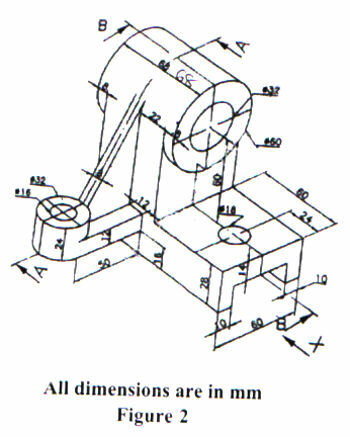 (15 marks) 4(a) The distance between the end projectors of a line AB is 60mm. The end A is 25mm above H.P. 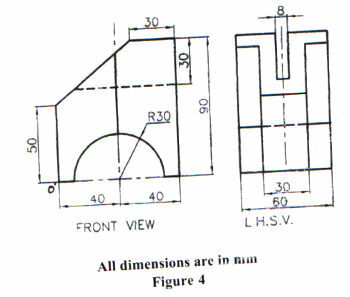 and 45mm in front of V.P., while the order end B is 60mm above H.P. and 15mm in front of V.P. Draw projections and find the true length and also inclination of the line with H.P. and V.P. 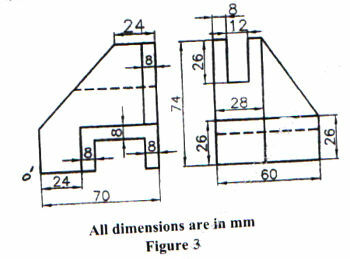 (9 marks) 4(b) Figure 3 shows two views of an object. 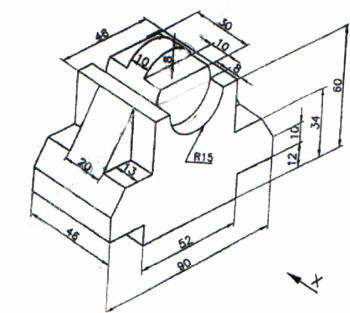 Draw isometric view of the object.